On the south shore of the third largest man-made reservoir in the nation, lies Lake Sakakawea State Park. The park is surrounded by miles of lakeshore, providing stunning views. Visitors can spend time at the swim beach, camping beneath the trees, hiking on the trails, or out on the lake. Sailboaters and windsurfers can take advantage of North Dakota’s fabled wind, on this 368,000-acre lake. Lake Sakakawea is known for its premier fishing. The lake is home to Walleye, Northern Pike and Chinook Salmon. 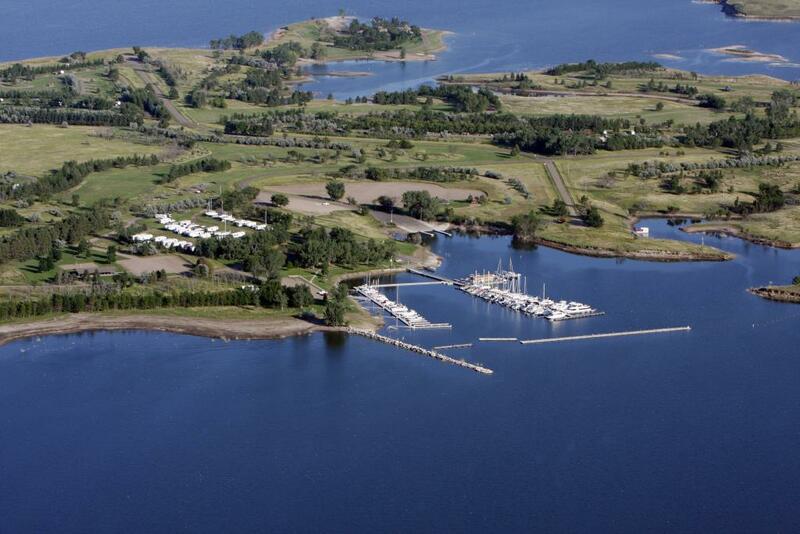 Anglers can find a full-service marina, a convenience store, and a fish cleaning station. Boat ramps in the park offer deep water access to some of the best salmon fishing on the lake. The park is also home to the Western Terminus of the North Country National Scenic Trail, a trail stretching 4,600 miles over 7 states from Lake Sakakawea State Park in North Dakota to the Vermont border of New York. The trail also passes through Fort Ransom State Park. Lake Sakakawea State Park is home to two seasonal camping cabins. 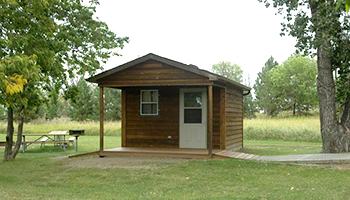 The cabins are located in the Sanish Campground and are both handicap accessible. The marina has a functional elevation range from 1805msl to 1855msl and is protected by a concrete breakwater. Marina facilities are supported by Lakeshore convenience store, a gas dock, pump-out service, and boat and camper storage. A total of 74 slips ranging in size from 24-72 feet in length are available for seasonal rent along with 3 transient slips available for daily use. For questions concerning the marina or slip rentals, contact the park directly by at (701) 487-3315 or e-mail at lssp@nd.gov. Open Memorial Day through Labor Day Lakeshore store sells hand-dipped ice cream, ice, beverages, pizzas, bait, tackle, clothing, camping gear, and ND products. Wi-Fi is available inside the store and extends to the near-by dock areas. Personal Floatation Devices (PFD’s) are offered on loan for both adults and children. Helmets included with rental. Four fat tire bikes are available for rent. 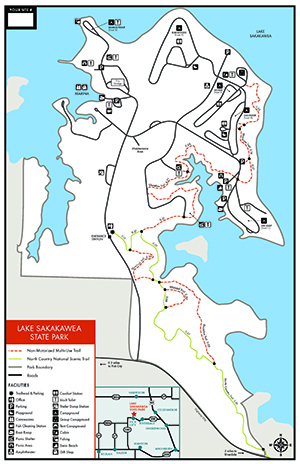 The park is the terminus of the North Country National Scenic Trail which, when completed, will stretch 4,600 miles from upstate New York to Lake Sakakawea State Park. Several multi-use trails in the park are perfect for hiking, biking, cross-country skiing and snowshoeing. Hikers are encouraged to take in the scenic beauty of the completed segments of the North Country National Scenic Trail found in this park. The North Country Trail is one of this park’s highlights. Beginning at Crown Point in eastern New York the trail crosses seven states before ending at the western terminus of Lake Sakakawea State Park. The NCT is the longest continuous hiking trail (4600 miles) in the U.S. The trail can be accessed just outside the Visitor Center where a large sign rises from the hill prairie with a backdrop of Lake Sakakawea, affording a nice place for photos. This shortgrass prairie is home to a myriad of native flowers and pollinators. The trail continues through mature elm/ash coulees where deer, pheasants and numerous birds may be sighted. The trail climbs in elevation as it hooks up with Whitetail Trail and continues down to the south end of the park where there is a good view of the Army Corps of Engineer’s Intake Structure leading to the Garrison Dam. The Shoreline Trail transverses the entire length, North-South of the park and is the longest distance trail at this site. Beginning at the east side of the Sanish Group sites the trail follows where the waters of Lake Sakakawea waters meet the land. One will experience the many outcroppings of scoria formations, along with petrified trunks of ancient trees. There are several coal veins that strongly contrast against the red scoria rocks. The tail’s southern end encompasses several quieter bays where shorebirds and waterfowl may be seen. Whitetail Loop is the park’s shortest loop, but rich with a variety of mature elm, juneberry, ash and Buffaloberry tree species. This is a favorite site for watching Yellow Warblers, Catbirds, Brown Thrashers, Rufus Tohee and other native birds. This trail hooks up with The North Country Trail on the west side of this loop. There is a moderate climb in elevation along this loop. The Overlook Trail begins just past the Visitor Center and the edge of a shaded coulee where Chokecherry trees fill with fruit in late August. The trail continues towards the lake where there is a breathtaking overlook, girdled with unadulterated prairie containing mature Yucca, Blazing Star, Prickly Pear Cactus, Leadplant and a host of other native forbs and grasses. This point also is a photo paradise as the Main Intake Structure for the Garrison Dam is in full view. This trail also accesses The North Country Trail, Whitetail and Shoreline trails as it travels east towards the lake.